Here's a wonderful and refreshing book from Danielle Krysa, blogger at The Jealous Curator, at art blog that you should definitely check out also. 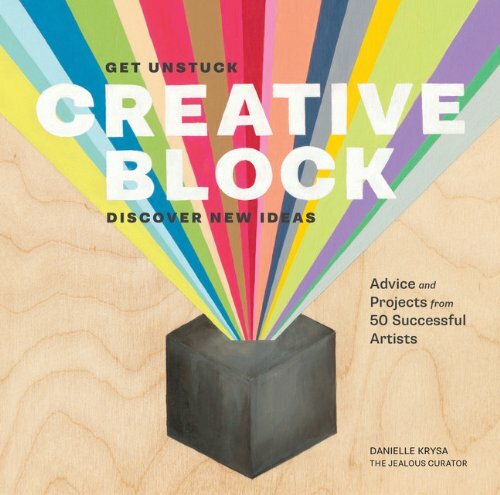 Creative Block features the advice and artworks of 50 successful artists. Each artist has a short profile and then move on to talk about where they find inspiration, how they handle creative blocks, challenges and criticism. At the end, there's a short project idea to get your hands and brain working. I love the artworks featured. The artists work with different medium so you get to see stuff like illustrations, collages, paintings, installation art, sculptures, paper art and more. The interviews come across as casual and candid, and there are always surprising things to read about, such as the jobs that those artists imagined they would end up in. As an artist myself, I find it interesting to learn about what other artists are thinking and doing. There are many new artists to check out also. This is a book you can read from cover to cover, or just hop in to any page for some inspiration. Highly recommended. This book should appeal to artists from any background.